I'll be honest: I don't have time to upload resized photos to this website anymore. It started as a place to keep all our pictures so that anyone could see them, but these days they all go on Facebook anyway, so it makes sense to link directly to there, rather than spend hours constructing new galleries. All the links you see below, therefore, will take you straight to Facebook. Please note: you don't need a Facebook account to view them! Gammon, turkey, cheese, and family. And, an Oxford comma. The prospect of London on a Saturday in the middle of winter - with four children - was perhaps bordering on insane, but the secret of a good family day out is the ability to plan. Fortunately, Emily possesses this in spades, so we managed to get round to ten of the statues on the Paddington Trail, as well as seeing Big Ben and the London Eye, and the Docklands Light Railway. Oh, and two hours in Hamleys, but I'm not going to talk about that. Sometimes, at night, I can still hear the screaming. Edward doesn't really know many people just yet, so each of the boys invited a friend to come and play, and that suited everyone just fine. There is a pear. And there is a badge. And there is cake. We hadn't visited Cambridge in years, and figured it was about time we caught up with some old friends, so we booked a room in a Travelodge for a few days in October half term and saw as many people as we could. On the way back we stopped off in Stevenage, and met a couple of extremely adorable dogs. And a very grumpy cat. 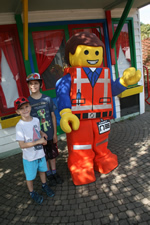 Joshua's been to Legoland before, but the rest of us thought it was time we followed suit, so on the last day before school reconvened for the autumn we drove down to Windsor and made a day of it. We managed most of the big rides, and spent a long time in Miniland looking at model shuttles and windmills and football stadiums (complete with streaker). The weather was glorious, and it was about the perfect end to the summer. Greenbelt was...different this year. The site was new, relocating from the turf and concrete of Cheltenham Racecourse to the greenery and forestry of Boughton House. Site access was problematic, but the crew did the very best they could. We chose not to work this year, figuring that a new site with four children was going to have enough challenges. It did, but it really was very pretty. Two weeks in Pembrokeshire over the summer, with ice cream, teacakes, inflatable boats and crabs. And a watermelon Dalek. Ah, Minecraft. You either know about it or you don't. If you don't, imagine a virtual Lego set enabling you to build just about anything you want. We managed to avoid two hours of sitting around in front of the XBox by having certain real world counterparts - mask design, a variation of port and starboard, and a Minecraft-themed scavenger hunt. The cake was perhaps Emily's crowning glory. Thomas wanted a Pac-Man party, so that's what he got. We had a pinata, and a game where the children ran around the garden collecting plastic balls while the two of us chased him, wearing ghost costumes. Mercifully this event does not exist on film. We put off Edward's dedication until the spring, so as to make the most of the warmer weather, and by the time it rolled around the nights were longer and the garden was perfect for playing. The cousins gathered on the climbing frame while Benjamin got obsessed with the ride-on tractor. As is traditional, Playmobil features. Emily's parents celebrated their ruby wedding anniversary in the spring, so we spent a few days down there helping. There were dinners and parties and old slideshows, and James broke a table by sitting on it. Again. In half term, we decided to go on one of those heritage tours to show the boys where their (paternal) grandparents came from. This entailed a whistlestop tour of Southborough, before we moved onto Folkestone. We caught up with aunts and cousins and visited Dover Castle, and the boys even got to play on the beach - in February!